LV Prasad Eye Institute’s Eye Health Pyramid model provides high-quality comprehensive eye care and is equipped with excellent infrastructure, with permanent facilities in remote rural villages to perform complex surgeries. Hyderabad: India is home to half of the world’s blind population. Out of the 15 million blind people in the country, 6.8 million are victims of corneal blindness and this number is expected to rise to 10.6 million by 2020. In India, where poverty is still widespread, corneal blindness is most often found in underprivileged and underserved populations. LV Prasad Eye Institute (LVPEI) is driven by its mission of taking eye care closer to the doorsteps of rural communities. This month on 5th April, the Institute’s 100th corneal transplant in rural centre eye care network was performed at its Mudhole secondary eye centre. The journey of providing complex surgical care right at the doorsteps of rural communities started in March 2016 with the first corneal transplant being performed at the Institute’s Dhulipalla secondary eye centre in Guntur District. 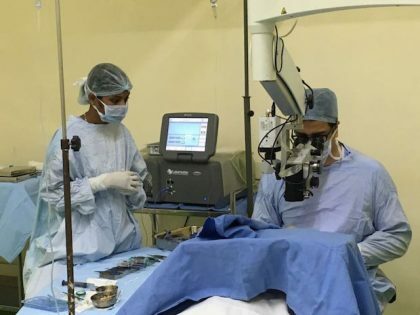 In a span of just three years, the secondary centre networks in Mudhole (Nirmal District), Dhulipalla (Guntur District), Venkatachalam (Nellore District) and Paloncha (Bhadradri Kothagudem District) have collectively performed a hundred corneal transplants. LVPEI believes in its vision of providing equitable and efficient eye care to all sections of society. Its Eye Health Pyramid model provides high-quality comprehensive eye care and is equipped with excellent infrastructure, with permanent facilities in remote rural villages to perform complex surgeries. Congratulating his team of surgeons and eye banking experts, Dr Gullapalli N Rao, Founder and Chair, L V Prasad Eye Institute said, “This achievement is an example of a “road never travelled”. Over the past 32 years, LVPEI has worked to greatly increase the collection of transplantable donor corneas and elevate eye banking performance standards in India, other parts of Asia and the developing world. The institute’s expert cornea surgeons have been able to achieve exceptional outcomes of transplantation surgeries thanks in large measure to the high standards of eye banking, besides their own world-class training and expertise. Established in 1989, the Ramayamma International Eye Bank (RIEB) at LVPEI is the largest provider of sight-restoring corneas in India and a SightLife Centre of Excellence in Eye Banking. In 2015, L V Prasad Eye Institute had created history in the field of Corneal Transplantation by becoming the first single Institute ever in the world to achieve 20,000 corneal transplants across its network. Some of the most prevalent indications of corneal transplant include severe corneal infection, corneal degeneration, trauma, workplace injury, corneal scarring, corneal opacity that is often secondary to cataract surgery and inherited diseases of the cornea. However, the surgery is usually restricted to larger urban centres with access to an eye bank. Often, it is a financial burden to the poor farm labour in rural villages as they must forego their daily wages to undergo treatment in a city, besides spending from their pockets for their travel and stay. “LVPEI’s rural secondary eye centres are fully equipped facilities that routinely perform cataract and simple glaucoma surgeries. But now since the past three years, we have successfully scaled up our secondary centres’ medical and surgical reach to the doorsteps of India’s rural hinterlands by performing complex surgeries. Patients no longer have to travel to a bigger city for eye care. The staff at our secondary centres are adequately trained to take care of post-operative care of corneal transplant patients,” Dr Rao added.